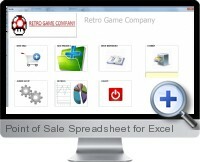 Excel Point of Sale (POS) spreadsheet system is designed as a lightweight and intuitive sales register solution for retail businesses. The highly customizable interface allows to quickly setup a POS system for specific business types with product stock detail management including automated inventory levels. Additional functionality including customer relations management (CRM) and aggregated sales reporting make the system ideal for an all-inclusive point of sales system. In addition, large buttons and simple navigation allow the system to be deployed on touch enables tablet devices at the checkout. Easy to setup and robust processing. The interface and register is full color with point and click functionality. Business specific branding can be applied including color and logo. Product images stored for easy selection and updating. Multiple product metadata is supported such as SKU numbers, pricing and descriptions. Stock level control and inventory management is integrated to the sales process and also available as a standalone interface. Sales tax can be configured on setup. Customer database for relations management is built-in along with search functionality for both products and customers. Fully functional invoice creation, printing and emailing to customers with automation options and integration with Word. Product discounts, gift cards, vouchers and incentive promotions can be easily configured. Advanced sales metrics for reporting and accounting purposes. Dropbox integration for syncing and backing up data to the cloud. Functions with Excel 2007 or higher.